Utah Royals FC and the Orlando Pride played to a 0-0 draw at Rio Tinto Stadium in Sandy Utah on Wednesday night in front of 7,137 fans. Utah and Orlando had met once before this year — with the two sides settling for a 1-1 result to open up the 2018 NWSL season at Orlando City Stadium on March 24. Week 7 was another even battle between Utah Royals FC and the Pride. Utah improves to 1-1-5 and Orlando to 2-2-3. The match featured two teams that were in stride from Week 6 action — Utah earned their first franchise win in a 2-0 victory over the Washington Spirit and the Pride picked up three points in a 2-0 result over the Chicago Red Stars. In the first half neither Utah or Orlando recorded a shot on target. Utah midfielder Diana Matheson, who earned Week 6’s Goal of the Week nod, was steady in the middle making her signature slide tackle to give her team possession. Through the first half Utah had the better of the possession with 54.8% to the Pride’s 45.2%. Utah also had five shots and Orlando had one — although none were on target. The second half stirred in more action with Pride forward Chioma Ubogagu looking to build on her team-high three goals. She had a promising chance in the 52nd minute to put her team ahead, but her left footed shot went wide. Shortly after she was subbed out for Alex Morgan — who missed Week 6 with a hyperextended left knee. Utah had a promising chance in the 68th minute when Matheson found space down the right flank and crossed one into the box where Amy Rodriguez was crashing. Rodriguez struck the cross one-time, but her shot went wide. In the 79th minute and through the final 10 minutes of the game, Utah Royals FC looked like they were going to pick up the big three points at home. Kelley O’Hara went down with an injury in the 88th minute during a fast break for Utah when forward Brittany Ratcliffe and O’Hara were both crashing the net for the go-ahead goal. O’Hara exited the game and midfielder Erika Tymrak replaced her for the final minutes. Laura Harvey had no update on Kelley O’Hara’s injury, but she said she believes it was the same nagging hamstring injury flaring up again. Utah forward Katie Stengel had a 90th minute chance that looked like it would be the deciding goal, but her shot went just wide right. Utah finished the game with 13 total shots, just one on target and the Pride with four shots and two on target. The home team had the better of the possession on the night with 56.6% to the Pride’s 43.4%. Utah midfielder Desiree Scott earned five tackles and two interceptions on the night and Utah defender Becky Sauerbrunn also was steady for her team, earning three clearances and four interceptions in the draw. For the Pride, midfielder Dani Weatherholt led the way defensively with four tackles, two clearances and two interceptions. Defender Shelina Zadorsky made five clearances on the night, extending her total clearances on the year to 36, a team-best. Utah Royals FC will get a breather before hosting the Houston Dash on Saturday, May 19. The Pride will make a quick turnaround as they travel to Providence Park on Saturday, May 12 to play Portland Thorns FC. Match ends, Utah Royals 0, Orlando Pride 0. Second Half ends, Utah Royals 0, Orlando Pride 0. Hand ball by Shelina Zadorsky (Orlando Pride). Attempt missed. Gunnhildur Yrsa Jonsdottir (Utah Royals) left footed shot from the centre of the box is too high. Assisted by Erika Tymrak with a cross. Substitution, Utah Royals. Erika Tymrak replaces Kelley O'Hara. Delay in match Brittany Ratcliffe (Utah Royals) because of an injury. Corner, Utah Royals. Conceded by Ali Krieger. Attempt blocked. Katie Stengel (Utah Royals) left footed shot from outside the box is blocked. Attempt saved. Brittany Ratcliffe (Utah Royals) right footed shot from the right side of the box is saved in the bottom left corner. Assisted by Katrina-Lee Gorry. Katrina-Lee Gorry (Utah Royals) is shown the yellow card for a bad foul. Substitution, Orlando Pride. Christine Nairn replaces Marta. Substitution, Utah Royals. Brittany Ratcliffe replaces Diana Matheson. Attempt missed. Katie Stengel (Utah Royals) header from the centre of the box misses to the right. Assisted by Kelley O'Hara with a cross. Attempt missed. Alanna Kennedy (Orlando Pride) right footed shot from the centre of the box misses to the right. Assisted by Rachel Hill with a cross. Attempt saved. Rachel Hill (Orlando Pride) right footed shot from the right side of the box is saved in the centre of the goal. Assisted by Alex Morgan with a headed pass. Substitution, Orlando Pride. Rachel Hill replaces Emily van Egmond. Attempt missed. 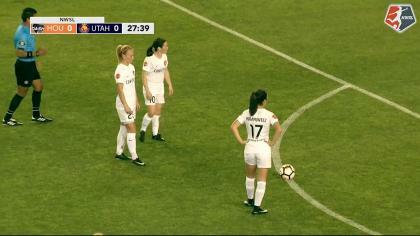 Amy Rodriguez (Utah Royals) left footed shot from the left side of the six yard box misses to the right. Assisted by Diana Matheson with a cross. Corner, Utah Royals. Conceded by Alanna Kennedy. Desiree Scott (Utah Royals) wins a free kick on the right wing. Kelley O'Hara (Utah Royals) wins a free kick on the left wing. Attempt missed. Kelley O'Hara (Utah Royals) right footed shot from outside the box is too high. Assisted by Rebecca Moros. Attempt missed. Brooke Elby (Utah Royals) right footed shot from outside the box misses to the left. Offside, Utah Royals. Abby Smith tries a through ball, but Kelley O'Hara is caught offside. Attempt saved. 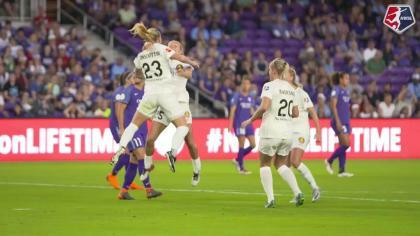 Emily van Egmond (Orlando Pride) right footed shot from outside the box is saved in the bottom right corner. Substitution, Orlando Pride. Alex Morgan replaces Chioma Ubogagu. Attempt missed. Chioma Ubogagu (Orlando Pride) left footed shot from the left side of the box misses to the left. Assisted by Emily van Egmond. Attempt blocked. Brooke Elby (Utah Royals) right footed shot from outside the box is blocked. Assisted by Desiree Scott. Corner, Utah Royals. Conceded by Dani Weatherholt. Offside, Orlando Pride. Alanna Kennedy tries a through ball, but Marta is caught offside. Second Half begins Utah Royals 0, Orlando Pride 0. First Half ends, Utah Royals 0, Orlando Pride 0. Attempt missed. Rachel Corsie (Utah Royals) header from very close range is just a bit too high. Assisted by Katrina-Lee Gorry with a cross following a corner. Corner, Utah Royals. Conceded by Sydney Leroux. Attempt blocked. Kelley O'Hara (Utah Royals) right footed shot from outside the box is blocked. Attempt blocked. Brooke Elby (Utah Royals) left footed shot from the right side of the box is blocked. Assisted by Rachel Corsie. Attempt blocked. Diana Matheson (Utah Royals) left footed shot from outside the box is blocked. Assisted by Amy Rodriguez. Alanna Kennedy (Orlando Pride) wins a free kick on the right wing. Attempt missed. Sydney Leroux (Orlando Pride) right footed shot from outside the box misses to the right. Assisted by Marta. Corner, Orlando Pride. Conceded by Desiree Scott. Corner, Utah Royals. Conceded by Chioma Ubogagu. Attempt missed. Gunnhildur Yrsa Jonsdottir (Utah Royals) header from the centre of the box is too high. Assisted by Katrina-Lee Gorry following a set piece situation.